Way Way TLDR: Playtest your fan cards. That's 10,000 words condensed down to four! The first rule about creating custom fan cards for Dominion is that you can ignore every single rule about it if you want to. Dominion is a game. Its purpose is fun. If you've got a card idea that sounds fun, do it. Playtest it. If it remains fun after scrutiny, keep playing with it. Donald X. Vaccarino, the creator of Dominion, on house rules and variants: "I encourage people to play whatever game variants they want, provided they comply with local laws and are agreed upon by all players." However, this guide might help you create balanced cards without falling into as many pitfalls along the way. If you get past all those, you might still have trouble figuring out how to cost your cards. This guide might help you there, too. Additionally, the later sections of the guide discuss issues related to creating artwork for your cards, printing them, and using them. (1) Be intimately familiar with all of the official Dominion cards and how to make the best use of them. You don't have to be an expert Dominion player, but you should be an expert at knowing what each card does and when and why you'd want to use it. Okay, so you don't technically have to know ALL the cards, but my point is that there are more design principles behind the published cards than you might think at first glance. Knowing why the official cards are the way they are will keep you out of the same traps they avoid. (2) Simplicity is a good thing. You don't want your cards to be any more complicated than they have to be. If you have an idea for a card, try to boil it down as simply as possible without losing the essence of the idea. Note, by the way, that by "simplicity," I'm talking about the concepts you use, not necessarily how complex and careful the the card text has to be to convey those concepts. Native Village, for example, has a wall of text on it, but that's okay since the concept itself is a simple one. Once players learn what it does, they don't have to reread the card text every time just to make sure each use conforms to every nuance. (3) Try to recognize cards that will be "swingy" and avoid them, unless adding swinginess to the game is your intention. By "swingy," I mean a card that will tip the balance of the game too much, especially in a random way. In general, you want to reward good strategy, not random luck. As an example, suppose you had an attack card that allowed you to take the top card of the deck of the player to your left. You might get lucky and turn up a Colony, resulting in a 20-point swing in your favor -- more than the margin of victory for many if not most Dominion games. Or you might get very unlucky and turn up a Curse, resulting in a 2-point swing against you. With such a card, strategic play scarcely matters. The winner is whoever gets luckier with that attack. Swinginess does exist in the official Dominion cards but on a dramatically smaller scale. Saboteur turning a Colony into a Province is only a 4-point swing. Swindler turning a Province into a Peddler is a defensible edge case. Thief only works on treasure: a plentiful, non-scoring resource. (4) Make sure your card scales well to multiple players. It's okay if a card plays differently with different numbers of players -- many of the official cards do, like Thief and Pirate Ship -- but you don't want a card that only works with a certain number and is brokenly weak or brokenly strong otherwise. Note that it is no accident that Witch affects all opponents, while Tribute only affects one. The other way around, and neither Witch nor Tribute would scale properly with different numbers of players. (5) Try to avoid cards that encourage uninteresting strategies. You probably don't want to disincentivize creative or otherwise interesting play. As a trivial example, let's say you had a Duration card that prohibited other players from playing action cards while it's in play. This would cause all your opponents' Action cards to be dead cards. How would they defend against this? By not buying action cards and pursuing a money strategy instead. That, in turn, would discourage you from using your new Duration card in the first place, and the game would degenerate into a simple race for money. You can't anticipate everything, but if you spend a little time to think about the impact your custom cards will have, you can save yourself a lot of playtesting time. (6) Just because a card is "fair" doesn't make it "balanced." A card is "fair" if all players have equal opportunity to obtain the card and reap the same benefits from playing it. Fairness is good. But just because a card is fair doesn't make it balanced. Imagine a Treasure/Victory card that costs $2, is worth $10, and counts 100 VP at the end of the game. It's fair, as all players have equal opportunities to obtain it. But the optimal strategy, dramatically excluding all others, is to buy only those until the pile is gone. And then it doesn't matter what you do, because the loser of that race can't hope to make up the VP deficit with mere Provinces. The card is, while fair, grotesquely unbalanced. Balance problems with fan cards are unfortunately going to be more subtle than this. Usually it's going to be a judgment call. If Minion, Saboteur, Wharf, and Goons had been fan cards, I'm pretty sure the reaction from experienced Dominion players would be to decry them as unbalanced. They do walk the edge. But the point is that balance isn't an objective yes or no but a judgment call: if they greatly shape the games they're in (as is also the case with Gardens, Witch, Ambassador, and others), does that influence make the game more or less fun? At the other extreme, as Donald X. has said, if you have a card that doesn't change the game at all, what's the point? The card ideas in this section come up frequently and are generally considered weak or broken for reasons that are not always obvious. I'll try to list these here and explain the problems with them. Again, though, keep my opening paragraph in mind. Do what you think will be fun, and if it's an idea on this list, so be it. But if you do, it's worth understanding the problems you're liable to face. (1) Reactions that harm the attacker, in particular reflecting the attack. This kind of idea comes up a lot. Sometimes the reaction is that the attack is reflected back on the attacker; at other times, some other form of harm befalls the attacker. Also variable is whether or not the attack still goes through to the reactor or not. The basic problem with these kinds of reactions is that they make people afraid to play attack cards in the first place. And if they don't want to play attack cards, they don't buy attack cards. And if they don't buy attack cards, you won't have any need for your reaction card, either. The end result is that both the attacks and the reactions are left on the table. If you create a non-terminal reaction, it's important to think through the ramifications. In particular, consider drawing non-terminal reactions very carefully. The issue is that making reactions non-terminal allows a player to stock up on them and thus pretty much always have one in hand when needed. Imagine adding a Moat-like reaction to Laboratory. You could buy them all up without harm to your deck, render attacks useless on virtually every turn, and still have a strong deck in its own right. This problem is not insurmountable. The Reaction effect doesn't have to be an "attacks stop dead" effect like Moat has, and/or the Action component doesn't have to be as strong as Laboratory. But if you contemplate a non-terminal Reaction card -- again, especially drawing non-terminals, which do little or no harm to buy en masse -- consider the ramifications to the gameplay if one or more players decide to spam them. (3) Reactions that are overpowered when revealed multiple times. A subtle but significant rule about Reaction cards is that they can be revealed an unlimited number of times in response to any single event. Many fan Reaction cards aren't designed with this rule in mind. Consider this Reaction card: "When another player plays an attack card, you may reveal this from your hand. If you do, +1 Card." With such a card, the moment someone plays a single Witch, I can reveal it as many times as I need to to draw my entire deck and discard pile into my hand. The official Reaction cards don't have this problem because they either do not stack (Moat and Secret Chamber, for example, don't do anything the second time that they can't do the first time) or cannot be reused (Horse Traders gets set aside when revealed). If you have a Reaction effect that could stack if the card is revealed repeatedly, you can solve this problem either by using the Horse Traders mechanic of having the card set aside and returned to your hand later, or you can require that the card is discarded when revealed. I'm sure these aren't the only viable solutions, but avoid special-case card text like, "You may only reveal this once per attack." The reason is that then it's hard for other players to account for whether you're revealing the same Reaction card multiple times or different copies of it in succession. This is especially true when you also have Secret Chamber, which could potentially rotate different copies of your other Reaction cards in and out of your hand. (4) Reactions to things other than attacks. Let me be clear: This is not a bad idea. There is probably a lot of design space still unexplored for Reactions that react to things other than attacks. The Dominion rules specifically allow for Reaction cards to be able to potentially react to any number of different kinds of events. But a word of caution: If you create a card that reacts to an event that no official Reaction card reacts to, think that through. A bad decision here could severely bog down the game. For example, imagine the following card: "When another player plays a Treasure card, you may reveal and discard this card from your hand. If you do, the other player trashes the Treasure card immediately." Here's the problem: Do you really want all players to have to wait, every single time they play a Treasure card, to see if anybody is going to play this Reaction to it? Without such a card, players will often lay their Treasure cards down all at once, which keeps the game moving quickly. But with such a Reaction card in play, it's strategically disadvantageous to do this, as then the Reactor will be able to make a more informed decision about which Treasure card he'd like to trash with it. To date, the existing Reaction cards only react to events that would require that player to do something anyway. When someone plays Militia, there is already a natural pause in the game to wait for the other players to discard down to 3 cards in hand. The natural pause allows for the timely revealing of a Reaction card, like Moat, and not slow the game down any further. Similarly, Watchtower activates when the player holding a Watchtower in hand gains a card -- another moment in the game when the Reactor would be expected to act anyhow. I'm not suggesting that Reaction cards should ONLY react to events that cause the Reactor to act. But they should probably only react to what are already natural breaks in the game. (5) Powerful cards that incur negative VPs or gain Curses. This comes up a lot, perhaps more than any other idea on this list. Examples are numerous. Basically you invent a cheap but powerful card and attach a negative VP penalty to try to balance it. On the surface, this idea presents an intriguing dilemma to the player: Do you take the hit to your score in the hopes that the extra power will enable you to overcome the deficit? The problem is that there is essentially no way to make such a card balanced. In a kingdom where trashing is possible, the correct play is probably to buy these cards, reap their benefits, and trash them before the game ends, circumventing the penalty entirely. To balance the card in such a kingdom, the VP penalty would have to be quite steep, to offset the likelihood that the card will be trashed before the game ends. But if the VP penalty is steep enough to balance that situation, it will be way too steep in kingdoms without trashing available, as then the VP penalty would be too great to risk. Many people try to correct this problem by adding a clause to the card such as "This card cannot be trashed" or "If this card is trashed, place it in your discard pile instead of the trash pile." This kind of special-case rule rubs me wrong (there's a section on special-case rules later), though it might be workable in this case. Another workaround people use is "When you buy this card, gain a Curse." 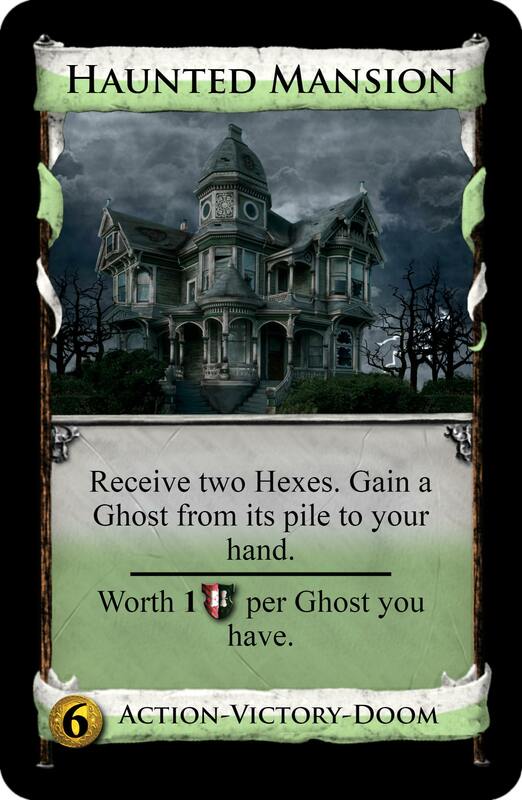 Or, since the Curse pile can run out and gained Curse cards can be trashed, the concept of a "curse token" is employed: "When you buy this card, gain X curse tokens." A curse token would be worth -1 VP at the end of the game, similarly to how Prosperity's Victory Tokens are worth +1 VP at the end of the game. Regardless, these solutions still come up short, although they're improvements on the original idea. The problem is that a power card can't be balanced with a fixed VP cost, for the simple reason that VP totals vary wildly from game to game, depending on the board. Dominion games can be won with 5 points and lost with 100. The difference between scores can be very small, meaning a -2 VP penalty could be decisive, or very large, making it insignificant. A counterargument to this is that one of the basic strategic principles of Dominion is recognizing that every card is good in some situations and bad in others, so a card that is powerful sometimes and weak at other times is no problem at all. But this kind of card seems to be usually either dominant or suicidal and only rarely in between. The best solution seems to be to cause a VP penalty to be incurred upon each USE of the card, rather than merely on the purchase of it. Then the VP penalty is directly proportional to the benefit you get from using it. In games with heavy-trashing, where the card would be used more often, the penalty is steeper. In no-trashing games, where the card would be used less often, the penalty is smaller. Seemingly the two best ways to incur a penalty upon use of the card are (1) "Gain X curse tokens," and (2) "Gain a Curse. If you do...." The former incurs an irreversible VP penalty. The latter puts a stop to free power plays when the Curses run out. Both deal damage in proportion to the use you get out of the card. (6) Attacks that trash random cards. An example of this is "Every other player trashes the top card of his deck." Donald X. frequently mentions this being a bad idea. The problem is that it's too swingy. One person loses a Curse. The next loses a Province. Unless a very swingy, very random game is what you're going for, you need to correct for this variance somehow. And then, even if you do, such cards usually aren't very fun. Players like to build up their decks. They get frustrated at seeing them regress. The closest an official card comes to using this idea is Saboteur, which corrects for the variance by allowing the player to gain a replacement card whose cost is determined by the cost of the trashed card. Even with this correction for balance, it's one of the least popular cards in the game. (7) Attacks that can wipe out a turn if stacked. "Every other player discards a card" is an example of such a card. By itself, it's fine. But if it gets played multiple times -- which, even in a kingdom without Villages or Throne Rooms, can happen easily in a 4-player game -- then the game can degenerate into a state where players discard most or all of their hands all the time and can't do anything. Many of the official Dominion cards are great examples of how to circumvent this problem. Notice that Militia doesn't read "discard two cards" but rather "discard down to 3 cards." Torturer does say "discard two cards" but allows a player to take a Curse instead. Sea Hag has you discard the top card of your deck to prevent five Sea Hags from obliterating your next turn. Cutpurse does hurt in multiples, but its effect is limited to how many Coppers you have in your hand. The damage multiple Bureaucrats can do is similarly constrained to how many Victory cards you have in your hand, and the "gain a Silver" clause of Bureaucrat cleverly dilutes a Bureaucrat-heavy deck, so that multiple Bureaucrats aren't likely to be played repeatedly throughout a game. The bottom line is you don't want to have an attack so strong that it can, by itself or stacked, completely ruin the next player's turn. Otherwise you can wind up in a game state where one player is locked out of being able to make any meaningful progress. If you know of the notorious King's Court-King's Court-Goons-Goons-Masquerade pin, you might cite that as a counterexample to this principle. This is a combination that CAN lock a player out of the rest of the game. But Donald X. has said that if he'd caught this combination in testing, he'd probably have nerfed it. In any case, it's an expensive five-card combination requiring three different unique cards from two different sets; as such, it only comes up relatively rarely and is tricky to pull off even if it does. It's not merely a case of playing a single card multiple times. (8) Attacks that target a specific player. By purposeful design, Dominion doesn't have attacks that target specific players. Many Dominion players appreciate the lack of politics in the game -- that is, the inevitable over-the-table negotiations and protests that result whenever a game allows a player to choose a specific opponent to target -- and thus may not appreciate a fan card that opens that door. That said, there is not necessarily anything broken about having targeted attacks in Dominion, so if that's what you want to do, go for it. (9) Attacks that offer no benefit to the player. Like almost everything in this list, this is not a firm rule. But before you create an attack card that ONLY harms other players, consider that of all the official cards, there are only two Attack cards that don't also provide some form of benefit to the player. These are Sea Hag, which is so strong for its cost that any additional benefit would overpower it; and Saboteur, which would be even more unpleasant than it already is if there were any additional incentive to use it. Even attacks as brutal as Mountebank, Witch, Ambassador, and Ghost Ship provide additional benefit to the player. Besides that benefit being necessary to achieve forward movement in the game, they also ensure that, if the attack portion is blocked by Moat, the attacking player hasn't utterly wasted his action. All I'm getting at is that if you create an Attack card with no benefit, make sure the decision not to include a benefit was a conscious and considered choice and not just something you overlooked. (10) Cards that reference limited card types. Examples of this would include "Gain an attack card," or "If you have at least three duration cards in play," or "You may trash up to 3 Curses," or "+$1 for every dual-typed card in your hand." The problem with these cards is simply that if they show up in kingdoms without any of these types present, the card is useless. You can still make such a card work if the card also has behavior that is sometimes worth buying anyway. This is the case with reaction cards such as Moat, Secret Chamber, and Horse Traders. In the absence of Attack cards in the kingdom, these may still be worth having for their other functions. Another way to solve the problem is for the card itself to force the intended condition. For example, a card that specifically references Potion cards is fine if it carries a Potion-based cost, as then, whenever that card would be present, Potions would be present also. Similarly, "Choose one: Trash any number of Curses from your hand; or every other player gains a Curse" would work, as then you wouldn't need a separate cursing card to be present. (11) Cards that require resources that frequently aren't available. This is similar to the above. One example of this kind of card would be something that has "-1 Buy" on it. I actually think that's a really cool idea; the problem is that it's dead in a kingdom with no +Buy cards. Still another example is a repeatedly proposed fan card that does only this: "+1 Card, +1 Action." Normally, this does nothing, as it merely replaces both the card slot and the action it uses up. But the justification for it is that it helps enable Conspirator, it lowers the price of Peddler, it can provide extra cards and actions with Throne Room or King's Court, it provides an extra unique card for Horn of Plenty, and so on. Yes, but the number of kingdoms with any of these cards in it is very small -- and in many of those, other cards will accomplish the same things. On the majority of boards, it's a dead pile. (12) Cards that retrieve cards from the trash pile. When cards are trashed, they're trashed for a reason. A fan card that does something like "Gain a card from the trash pile" is going to be useless most of the time, because even if there are trashers in the kingdom (and there may well not be), who wants Coppers, Estates, and Curses? If there are trash-for-benefit cards in the kingdom (like Salvager, Apprentice, Bishop, and the Remodel family), then you might find something good in there, but this will only be a small minority of boards. And within that minority, there's a good chance the card will be brokenly powerful, and/or players will be dissuaded from using the trash-for-benefit cards on good cards in the first place. Rogue and Graverobber retrieve cards from the trash, but they also put useful cards there to be retrieved at a later time. The balance is extremely delicate; any card that retrieves cards from the trash should be carefully tested. (13) Cards that stay out permanently. Nothing inherently wrong with this idea, but a minor point: Usually this kind of idea is proposed with a new card type of "Permanent" or something. If the card otherwise behaves like a Duration card, then just call it a Duration card instead of inventing a new type. According to the Seaside rules, Duration cards stay out until the last turn in which they have an effect. Although the specific Duration cards in Seaside all get discarded after the following turn (except for a failed Tactician, which gets cleaned up immediately), the Duration type itself allows for a card to remain out for any arbitrary number of turns. (14) Actions that are unnecessarily non-terminal. The presence or absence of +Actions might be the single most defining characteristic of an Action card. Two versions of the same card, differing only in one having +1 Action and the other not, will likely play wildly different from one another. It's not the differing number of +Cards, for example, that distinguishes Smithy from Laboratory. There is no firm rule concerning what kinds of Action cards should be terminal and which non-terminal. That decision is largely subjective. However, many fan cards include +1 Action when they might be more interesting without it. Make sure you consider the gameplay ramifications both ways. The right choice will be the one that makes the game's strategy more interesting, not necessarily the one that makes the card more appealing to purchase and use. Sometimes the lack of +Actions is best. Consider how much less interesting Courtyard would be if it provided +1 Action (assuming its price was adjusted to compensate). The strategic feature of the official version of the card -- being able to save a dead Action card for the next turn -- would be destroyed. On the other hand, sometimes you need +Actions to make the card work. A terminal version of Minion would be cute but weak; certainly not a card that a whole strategy could be built around. Again, though, the distinction isn't always clear, and there isn't always one right answer. The important thing is just to consider the matter and make a thoughtful decision. An example of such a card would be, "If this is in your hand at the start of your turn, you must play it immediately." The problem is that players can't be held accountable for following this rule. You'd have to have each player reveal his hand at the start of every turn, just so the other players can confirm that there is no copy of that card in hand to play. Otherwise it would be easy to keep the card in hand and secretly discard it underneath the other cards during clean-up. That said, if you only intend to use such a card when playing with friends you trust, by all means, try an idea like this out. Otherwise, make sure your cards allow for accountability. Note Bureaucrat and Cutpurse, which provide such a mechanism. Interestingly, not all of the cards in the base set are fully accountable. Throne Room, Mine, and Moneylender all require you to do something with a card in your hand, but if you don't have a card of the correct type, they don't tell you to reveal your hand to prove it. (Treasure Map, from Seaside, is also like this.) Donald X. has expressed regret over Throne Room specifically; however, these cards are not really that problematic since the "fix" for them would probably have been to make their effects optional, rather than adding in accountability to the requirement. On a card whose effect needs to be mandatory (e.g., the aforementioned Bureaucrat and Cutpurse attacks), accountability is much more important, and you should make sure your own cards allow for it. (16) Cards that look at the number of victory points or coins in your hand. There are lots of different incarnations of this. And example might be, "The player to your left reveals the top two cards of his deck. +$ equal to the number of victory points he reveals." Another one might be, "All players reveal their hands. The player with the least total treasure gains a Curse." Sidestepping balance issues in these specific examples that might jump out at you, these types of cards are unworkable because it's not always easy to quantify how many victory points or how much treasure you have in your hand. If only the base Victory cards are out, fine, but what if Gardens, Duke, Vineyard, or Fairgrounds is in play? You can't really calculate how much these are "worth" until the end of the game. Treasure values are similarly nebulous. Technically, treasure isn't worth any coins at all until it's played. When a treasure card is played, only then does it yield some number of coins. In the case of the base treasures, this amount is always the same. (Well, almost. See Coppersmith.) But Bank, Philosopher's Stone, and Diadem vary, and Potion's yield isn't in coins at all. Better approaches would be to count the number of Treasure or Victory cards, or look at the costs of those cards. In the latter case, you'll still have special cases in Philosopher's Stone and Vineyards, but many other Dominion cards (Salvager, Forge, Apprentice, etc) deal with (or ignore) Potion-based costs just fine. (17) Cards with special-case rules. Before using a special-case rule, be very sure you cannot achieve the effect you're after any other way. Even then, think long and hard about whether your special-case rule will cause conflicts with other rules or cards. For example, you might want to have a powerful card limited by the clause, "You may only play one copy of this card per turn." Fine, but what happens when Golem turns up two copies of it? Which card's rules get broken? Generally it's better for cards to work within the rules of Dominion than to override them. Even if a special-case rule poses no problem with the current set of official cards, you never know if something in a future expansion will cause a conflict. (18) Cards that depend on the order of the discard pile. An example of this would be, "Look at the top five cards of your Discard pile. Put two of them in your hand." Usually opening up Dominion's strategy space is a good thing; once in a while, not so much. It's no accident that no official Dominion card cares about the order that cards appear in the discard pile. The moment you introduce one that does, suddenly every player who buys it will have to think very carefully about how they perform every single clean-up phase, just in case they happen to draw that card in the next hand. This will dramatically slow down the game, and most of the time it'll still be wasted effort. You can still use the discard pile -- Counting House does it fine -- but if you use it at all, it's probably best to use all of it. (19) Cards that allow unlimited accumulation of victory tokens. Designing cards that award victory tokens is a trickier challenge than it seems. The reason is that you have to be careful not to allow a game to devolve into a game state where the optimum strategy for all players is to forego buying victory cards in favor of playing and replaying their victory-token-earning cards. Then the game never ends. Of the three official cards that award victory tokens, two of them are tied to finite resources. Goons only awards victory tokens when you buy a card, which ensures that sooner or later the game will eventually end normally. Bishop awards tokens by trashing cards, which indirectly ensures the same thing -- if you don't buy cards, you won't have cards to trash. Monument is the exception. In theory, if all players wind up with hands consisting of King's Court-King's Court-Monument-Monument-Monument, you could indeed wind up in an unending game state. But this doesn't really happen in practice, probably because of two things: one, Monument being a terminal makes it difficult to spam; two, it offers $, which encourages the purchase of cards. The lesson these official cards teach us is that if you have a fan card that awards victory tokens, make sure the game can't wind up in an unending game state. If you can't prove this to yourself with theory (as is the case with Goons), then you'll need even more playtesting than usual to make sure. Before I discuss how to price your cards, it's worth saying how NOT to price your cards, so you can undertake that task without any misleading preconceptions. (1) Myth: The cost scale is linear. One of the most important things to remember about card costs is that they are not linear. Since your initial starting deck generates an average of $3.5 every turn, that means the difference between $2 and $3 -- in terms of how difficult to is to achieve that amount -- is near insignificant. By contrast, $5 takes a bit of work to achieve, so the difference between $4 and $5 is quite a leap. In general, card costs of $6 and up are probably close enough to linear that you can treat them that way. But below that, you should be aware that the jumps between the different costs are not necessarily all equal. (2) Myth: Card costs are proportional to their strength. Card cost and strength are usually correlated, especially at $5 and up. But since there is so little practical difference between costs $2 to $4, costs in that range are more a function of gameplay balance with respect to the opening. Treasure Map, for example, is not priced at $4 because it's "roughly stronger than the $3 cards." (Ambassador would take issue with that.) It's priced at $4 to prevent players from opening double Treasure Map and potentially cashing them in for four Golds on Turn 3, which would be ridiculous. Treasure Map is swingy enough as it is, but a $3 Treasure Map would reduce Dominion to the strategic equivalent of High Card Draw. Another example of a power/cost mismatch is Chapel, whose strength would be competitive at $4 but was priced at $2 for game balance reasons. A more obvious way that card costs can be out of sync with their strength is when there are special circumstances concerning buying them. Grand Market is probably worth $7.5 or so on strength alone, but its "no Copper" clause allows it to be balanced at a cheaper price. Peddler, similarly, is not as strong as an $8 price tag suggests, since its cost fluctuates depending on the circumstances. (3) Myth: Given the above, card strength doesn't matter with respect to cost. Well, yes it does. Card strength is not a completely distinct issue from opening gameplay considerations. It's just not, on its own, the only and overriding concern. However, you do want to be careful about cards that are "strictly superior" or "strictly inferior" to other cards and price them accordingly. Worker's Village, being strictly superior to Village -- that is, essentially always at least providing all the benefits that Village provides -- kind of has to be priced higher. I say "kind of," because a $3 Worker's Village is more of an aesthetic problem than a gameplay problem. Worker's Village wouldn't really break the game at $3. But if Village and Worker's Village were both on the table at the same time, it would feel wrong, right? And the poor Village pile would go untouched. Pricing Worker's Village higher is better game design, because it keeps both cards useful and, therefore, leaves a larger number of strategic decisions up to the player. So if you figure out that your custom card is strictly superior or strictly inferior to another card, you should probably price it accordingly, and then make sure the card is still balanced at the resulting price. This may mean that some cards are just too difficult to price well. Suppose your card offers "+3 Cards, +1 Buy." It has to be higher than $4, because the strictly inferior Smithy is priced at $4. But at $5, your new card looks pretty weak next to Torturer, which also offers +3 Cards. Still, it is not STRICTLY weaker than Torturer, so $5 it is. Note, however, that it doesn't take much to break out of these "strict" constraints. Hunting Party might look funny priced at the same price as Laboratory, but there's at least one case where Hunting Party is inferior: if you have one copy of every card in your deck, playing Hunting Party will just cycle through your deck without letting you draw a second card, whereas you'd get a second card with Laboratory. This is a small case, but it's enough to allow Hunting Party to cost $5 instead of getting stuck with a less appropriate $6 cost. If you get stuck in a pricing dilemma like this, another option is to use a Potion-based cost. Note how Laboratory's and Alchemist's costs are incomparable, because they're priced on completely separate scales. (4) Myth: Each functional component of a card has a cost. Add those costs up, and that's what the whole card should cost. It might be tempting to say every +Buy costs $1, and every +Card costs $2, every Curse attack costs $3, and so on. But it doesn't work like that. For example, add +2 Actions to Woodcutter, which costs $3, and you get Festival, which costs $5. You might then think that each +Action should increase a card's cost by $1. But add just a single +Action to Moat, and now you've got something strictly superior to Laboratory. At minimum, it's a $6 card, up from $2. Add +2 Actions to Moat, and you probably have to go to $7, an increase of $5. (5) Myth: Cards shouldn't cost $X. If you're contemplating a card cost below $2, above $6, or especially above $7, and you don't have a good reason why, there's a very good chance you're doing something wrong. Many fan cards priced at $1 or $7+ would be better off buffed or nerfed into the $2 to $6 range. There's a reason why, of the 100+ official Dominion kingdom cards, only five (excluding the cards with Potion costs) have costs outside the $2 to $6 range. And one of those, Peddler, usually isn't bought at its base cost anyhow. Why? On the low end, it's extremely rare to have $1 to spend but not $2. On the high end, if you've got $8 or more to spend, the correct move is usually to buy a Province (or Platinum/Colony) regardless of what kind of power card might also be available. That said, there is nothing inherently broken about a card with a weird cost. Let's talk about a $1 cost first. Many players feel that there should never be a $1 card due to the dramatic gameplay change it would wreak with Upgrade and Remake. They would no longer be able to trash Coppers outright but instead clog your deck with other weak cards. Personally, I don't see this as a problem. With as many Dominion cards as there are, the introduction of a $1 card won't change most of them, but it WOULD make a set of games with their own flavor possible. That's the spirit of Dominion -- every game has its own unique set of interactions to puzzle through. This is essentially the argument Donald X. made before Prosperity came out with its four $7 cards. Prior to that, many Dominion players felt that there should never be a $7 card, because the $7 "hole" was an important and interesting component of the gameplay. But with the addition of $7 cards, that "hole" is still usually present, and, when it is not, a whole new set of interactions is available. On the upper end of the scale, recognize that not every game is a Colony game. A kingdom card costing $8 or more might work in a Colony game, but should anything be more expensive than a Province in a Province game? Maybe, but probably not. Even all the official $7 cards were made for Colony games, though they work in Province games too. Again, if you want to make a card with a weird price, by all means go for it. But do be aware that there will be weird ramifications that result. Your job is to make sure those weird ramifications have a positive rather than negative effect on the gameplay. I'm now going to seemingly contradict everything I said in the previous section. I'm going to treat the cost scale as linear. I'm going to break functional units down into cost components. I'm going to do everything you're not supposed to do. The reason is that although doing all these things is wrong as a proof or justification for a particular cost, they do help you arrive at a good ESTIMATE for what the right cost might be. You do need a starting estimate, after all, if you are to playtest your card. If you skip the playtesting step, you're better off pricing your cards by instinct, rather than embracing the myths I've gone to such trouble to expose. But if you promise to playtest, embrace them all with abandon, as that will help you come up with a good starting point for your card's cost. Then the playtesting will expose not only any problems with the card itself but the error in your cost estimate. (1) Comparing your card to official cards that are similar. (2) Calculating your card's cost based on its functional components. If the results of these three exercises differ, the playtesting step trumps all the others, but you'll probably need to playtest all the more thoroughly to make sure. (1) Step 1: Compare your card to official cards that are similar. The first step is to probably to compare your card to the most similar official cards. If it gains Silver, compare it to Bureaucrat and Explorer. If it dispenses curses, compare it to Witch, Young Witch, Familiar, Sea Hag, and Mountebank. And so on. You can even do this for individual components of behavior. If your card offers +3 Cards in addition to something else, you can still compare the card as a whole to Smithy, Torturer, and Rabble, even if that "something else" is exotic and dissimilar. If you have a money-earning card, you should compare your card to every other card that earns that same amount. For example, with a card that earns $2, compare it to Woodcutter, Militia, Navigator, Mountebank, Embargo, and -- most importantly -- Silver. If your card earns a variable amount of money, there are still numerous points of reference: Venture, Bank, and Philosopher's Stone amongst Treasure cards; Adventurer, Harvest, and Secret Chamber among Action cards. Villages benefit most from such a comparison, because there are so many points of reference available to help you. For example, if you have a Village-with-a-bonus card, is that bonus comparable to Mining Village, Farming Village, Worker's Village, and Walled Village? If so, you're probably looking at a $4 cost. But if it's better than that, competitive with Bazaar and Festival, maybe you're looking at $5. Notice if your card is "strictly superior" or "strictly inferior" to any official card. If so, you'll have to make sure your cost is higher or lower, respectively. Otherwise, you have some wiggle room. Regardless, the result of this comparison is that you'll probably find yourself zeroing in on a particular reference point. In the best case, you'll decide that your card is roughly equally as powerful as some other card, in which case it's likely it should be priced the same. Again, power level isn't the only consideration, but it's a good starting point. If you can't find a card that's roughly equal in power, maybe you can find one that is a little more powerful or a little less powerful. In that case, the best starting point might be one less or one more than the card you're comparing it with. In the $2 to $5 range, don't forget to consider how the cost changes the card's availability on the opening turns of the game. (2) Step 2: Calculate your card's cost based on its functional components. Again, remember that this technically doesn't work, because (1) the cost scale isn't linear; (2) functional components might be stronger or weaker based on what the rest of the card does. But if you keep all that in mind, you might be able to arrive at a starting guess for your card's cost if you attempt this thought experiment. It only applies to cards that have functional components that are well-understood. For example, if your card is "Chancellor with +1 Buy instead of the +$2," you can probably zero in on the best cost if you understand what the relative worth of +1 Buy and +$2 is. So what, then, are the most common functional components worth? +1 Buy is probably usually worth an extra coin, as demonstrated by Village and Worker's Village. Adding +1 Buy onto something is possibly not enough to warrant crossing the $4 to $5 threshold, but this valuation probably suffices for the lower costs. You should also consider whether the +1 Buy is just an unrelated buff or if it synergizes with what else the card does. For example, the +1 Buy on Worker's Village is just a extra bonus. On Salvager, Bridge, Goons, and Contraband, the +Buy makes the card as a whole work properly. (On Contraband, it allows you to compensate for being blocked from Provinces by picking up two Duchies instead of just one.) If the +Buy synergizes with the rest of the card, you can possibly justify a steeper price bump. Note, by the way, that a second +Buy is probably not worth the same price increase that the first +Buy is worth. Buys go unused quite frequently; the more +Buys your card offers, the more likely the extras will be unnecessary. I made a big mistake a while back, thinking that adding an extra +coin onto a card would warrant a $1 price increase. This is very wrong. To see how much +$1 is worth, just look at the cost difference between Copper and Silver, or between Silver and Gold. Look at Village vs. Bazaar. Look at Market vs. Grand Market, too, taking into account that without the Copper restriction on Grand Market it would be priced at $7 or higher. You might cite the small cost difference between Herbalist and Woodcutter as a counter-example, but Herbalist has an extra piece of functionality to boost it up. Depending on where you are in the cost scale -- and what else the card does -- each additional +$1 should probably boost the card's cost by $2 or $3. If you have a card that already has +1 Action, and you add a second +Action to it, you're probably safe raising the cost by a flat $1. It does depend on what else the card does. For example, take the second +Action off Village, and you have something much weaker than a $2-cost card. But in general you're probably fine by just flatly valuing the second +Action at $1. The reason is that adding an extra +Action onto a card that's already a non-terminal doesn't change its ability to be spammed; it only allows you to play an additional terminal action, if you even have one in your hand in the first place. The power of extra actions should not be underestimated, but it's probably unusual for it to be so great that the cost should go up by more than $1. The value of adding +1 Action onto a terminal action, however, is a very different consideration. Unfortunately, there is no good formula for it. It depends entirely on what the rest of the card does. To illustrate this point, let's make up a non-terminal Woodcutter: "+1 Action, +1 Buy, +$2." Since it is strictly superior to Woodcutter, we know its cost should be more than $3. To narrow it down further, we should compare this card to Festival and Silver. The Festival comparison is easy: our non-terminal Woodcutter is the same thing as a Festival without one of its +Actions. That points toward a cost of $4. We compare with Silver to make sure this is okay. Silver, costing $3, is roughly equivalent to an Action card reading "+1 Action, +$2." Our card is a little better than that, so again we arrive at a cost of $4. Great! Should we then conclude that turning an existing terminal action into a non-terminal action generally warrants a price increase of $1? Before we answer that, remember the Moat/Laboratory example I mentioned earlier. If we added +1 Action onto a Moat, which costs $2, we'd wind up with a card that is strictly superior to Laboratory, which costs $5. So we'd need to price a non-terminal version of Moat around $6 at a minimum. In that case, adding the +1 Action caused a price jump of at least $4! So how do you know how much +1 Action is "worth"? Basically you have to look at how much more powerful the card would be if you could play multiples. Drawing actions skyrocket in power, because your hand replenishes or grows as you play them. With non-drawing cards, your ability to spam a card is limited by your hand size, but with a strong enough card, that limitation isn't a big deal: You don't need to play very many non-terminal Mountebanks to secure a win for yourself. But if the other behavior of the card is weak, as is the case with Woodcutter, adding +1 Action probably isn't that big a deal. It all depends. As implied earlier, the value of +1 Card can only be assessed if you know if the card is terminal or non-terminal. With at least +1 Action, each additional +Card is ridiculously powerful. +1 Card, +1 Action is probably balanced at $0, but +2 Cards, +1 Action is already priced (quite correctly) at $5. +3 Cards, +1 Action is a power card of epic proportions that probably shouldn't exist at any cost. In a terminal card, you can think of the value of each +Card as a function of how much extra treasure it's likely to turn up. At the beginning of the game, each card is worth an average of $0.7. If you consider that +Cards also offers a cycling benefit (usually a good thing if you're buying actions and treasures and a bad thing when you start buying victory cards), the value of +1 Card and +$1 are pretty similar. Later on, your average card value usually gets much higher than $1. Later still, the cycling benefit of +Cards becomes a liability. On average, the difference between +Cards and +$ is probably a wash. So as a rule of thumb, you can probably think of +1 Card on a terminal action as being worth about what +$1 is worth, which is a cost increase of $2 or $3. This difference is illustrated by comparing Moat and Smithy. You might be tempted to evaluate how much +1 VP is worth by making some sort of comparison with Monument. But don't do this. The value of +VP is intimately dependent on how often you can play the card, which, in turn, is a function of the game length. And game length can be determined by what specific +VP cards are in play. Designing cards that use VP chips is a proposition much too tricky and nuanced to use this component pricing exercise on. (3) Step 3: Playtest your card! Although the previous two exercises can help you come up with a rough guess for what a card's cost should be, there is no substitute for playtesting. Even though you ultimately have to consider lots of different interactions your new card will have with the pre-existing cards, it will probably only take you one or two games to figure out if a card is incorrectly costed. I made up a card a while back that I was certain, based on the previous two exercises, should cost $4. After just a single playtest game, it was blindingly obvious that $5 was the correct cost. You don't even have to play a real game -- sometimes just simulating a game will suffice. Occasionally, cost errors can take upwards of three or four games to figure out, but usually not more than that. It'll just feel wrong. If this happens, try to think about why. That thought process will help you anticipate cost errors sooner when you design the next card. Now that you have the perfect fan card, maybe you want to print it for use in a live game. Well, first be aware that you do not have to print it to use it. If you want to use your card in a live game, you can write down what the card does on a piece of paper for reference, and then simply play with the blank cards that come with the game. If you have multiple sets of blanks, you can label them "A", "B", and so on, to differentiate them from each other. Then, for any given game, you can simply agree ahead of time what fan card each set of blanks refers to. But if you want to print your cards properly, there are a couple ways you can do that. First, however, if you are a stickler for detail -- or intend to play with anyone who is -- you might want to note the formatting conventions listed below. Otherwise, skip to the next part for ways you can print your finalized artwork. (1) Order the vanilla bonuses properly. If your card offers +Cards, +Actions, +Buys, +$, and/or +VP then list them in that order. It sounds nitpicky, but all of the official cards adhere to this strict ordering and have consequently trained our eyes to use shortcuts to ingest the information. For example, if the first thing on a card is a boldface "+1 Buy," many experienced players will immediately understand this to be a terminal action without reading further -- because the "+1 Action," had it been present, would have appeared above the "+1 Buy" line. Adhering to the standard ordering will guard against players misreading your cards. The only exception should be if the order of these vanilla bonuses needs to be different, as the order has a direct impact on the functionality of the card. Usually it does not, but if it does, then put the subsequent bonuses within the normal text of the card, as seen on the Cellar, Conspirator, and City cards. There is variation among the printed cards whether there should be a space between the plus sign and the number. The base set cards do not have such a space; subsequent sets sometimes do. For example, Smithy, Courtyard, and Rabble read "+3 Cards," while Torturer reads "+ 3 Cards." A few cards aren't even internally consistent: see Caravan and Grand Market. Use whatever you think looks best. The wording on Dominion cards is very simple and specific. Be as clear, concise, and consistent as you can with your wording. If your card is at all similar to anything an official card does, consult the official card and copy the relevant wording as appropriate. As an example that illustrates how important precise wording is, notice how very deliberately Hunting Party tells you to "reveal cards from your deck" at first and only after you've found a card that isn't a duplicate do you "put it into your hand and discard the rest." Had it instead told you to "Reveal cards from your deck, discarding each one that is a duplicate of a card in your hand," then you could quite easily wind up in a situation where you are drawing your whole deck and discard pile over and over and over again, because there are no unique cards left in them. Take care with your terminology, too. Certain words have specific meaning in Dominion. For example, don't use "purchase" if you mean "buy." Don't use "take" or "receive" if you mean "gain." As a good example for why the latter matters, note the difference between Ambassador and Masquerade. Ambassador uses the word "gain" and may therefore be countered by a Watchtower in hand. Masquerade does not, meaning that Watchtower cannot intervene. (3) Use a horizontal line where appropriate (and only where appropriate). A horizontal line on a Dominion card has a specific meaning: it separates what happens when you play the card from what happens at other times. Moat is a good example of this, as it separates the action ("+2 Cards") from the reaction ("When another player plays an Attack card....") Setup instructions, as seen on Young Witch and Black Market, are similarly divided. "While in play" clauses are subtly important to separate. These can be found on Goons, Lighthouse, and Princess, among others. Here, the horizontal line is important because it serves as a reminder of what NOT to double with Throne Room or triple with King's Court. Notice that there is no horizontal line between the "this turn" and "next turn" effects on Duration cards. Those are both things that happen by playing the card (and both get doubled with Throne Room and tripled with King's Court), so you don't want to separate them. (4) Plus signs with shield symbols. "2 (shield)" means "This card is worth 2 VP at the end of the game." However, if you add a plus sign -- for example, "+2 (shield)" -- this means "Gain two victory tokens." On the official cards, the card's name and type are rendered in the "Trajan Pro" font. This is a commercial font; however, there is a very similar free alternative called "Optimus Princeps." Use the boldface version. The card cost numbers are rendered in "Minion Pro," also a commercial font. "Book Antiqua" is a similar free alternative. On http://boardgamegeek.com/thread/426860/fan-made-card-apprentice, you can find template images for the most common card types. For best results, use professional image editing software, like Photoshop. Microsoft Paint is probably not going to work for you. Remember that even these card templates constitute proprietary artwork and are protected by copyright. Before using these images for any purpose, you may wish to research what constitutes fair use. Similarly, fair use issues may arise out of any additional artwork you add to these card templates. Need more blank cards? You can buy individual sets of blank cards. Searching Google Shopping will probably turn up a few different places to buy them. I buy mine at http://store.boardgamegeek.com/. If you sleeve your Dominion cards anyway, then the best way to use your custom cards is to print copies out on regular paper and insert the slip of paper into a sleeve with a standard Dominion card (a blank, for example) also in it. Then they look like official Dominion cards from the back and handle the same way. This also preserves the reusability of the blank cards. Whenever you want to change which fan card you're using, you just swap out the slips of paper. If you don't sleeve your cards, the alternatives aren't quite as clean. You can try using any of several online card printing services that will let you customize the fronts and backs of a set of playing cards. However, this poses two problems: (1) the thickness, texture, and possibly color tinting of cards made this way is unlikely to match the look and feel of the official Dominion cards, so they may not feel quite right when shuffling; (2) Dominion uses a European standard card size, 59mm by 92mm. All online custom card services I'm aware of only support U.S. standard card sizes, the most common being Bridge size (2.25" by 3.5", or 57mm by 89mm) and Poker size (2.5" by 3.5", or 62mm by 89mm). I've had satisfactory results printing the cards out on Avery Clear Full-Sheet Labels, which are quite thin. You can buy them directly at avery.com, through a reseller like amazon.com, or in any number of office supply stores like Staples. Make sure you get the right product for your printer: if you have an Inkjet printer, only use the labels made for Inkjet printers; if you have a Laser printer, only use the labels made for Laser printers. After printing your cards out, cut them out in dimensions slightly smaller than the Dominion card size, and apply them to the blank Dominion cards. This does make the cards a little thicker, but not in a dramatic or overly noticeable way. The texture of the colors will be a little different too. But while not a perfect solution, I've found it to be a satisfactory one. Part VII. Take Pride In Your Work! If you're enjoying yourself and proud of what you've created, ignore everything in this guide. Dominion is a game and having fun with it is all that ultimately matters. Geez, quite a book you've written, I wonder if this will encourage or scare designers away. Heh heh -- you must have started reading before I did a quick edit to put a TLDR at the top. It's a pretty impressive summary, if I say so myself. Nice work! Sounds like you know what you are talking about. Now I'm curious to see what fan made cards you have created, do you have a list of them somewhere? Check out the Variants forum. There are others that you can search the Variants forum for, but if you go back to July or previously, you'll see I made a few of the mistakes my guide warns against. Thanks for the links. I just recently joined this forum, so it will probably take me a while to catch up on everything that's already been posted. rink, this is superb work, you deserve a medal for this. I really enjoyed the highlight that certain card benefits should traditionally appear in a certain order. Also the notations about when lines are used and what text uses bold and what doesn't are also extremely helpful. This will make the fun of developing an expansion all the more fun. One of the joys of a hobby is attempting to perfect it. For my own purposes, I tried to use the base set as a guide, which I maintain is still one of the most intriguing and balancing sets of them all. This means I have no cards worth 7$ and only one card worth 6$. Play testing isn't easy...my wife has agreed to do it, but I feel you need hundreds of play tests to really get a feel. There's simply no substitute for play testing cards. I actually developed very simple cards, for a very simple game for Wizards. One of the reasons I was handed the job, was previous designers failed to play test and produced a very broken scenario, that was exploited at a national tournament much to the embarrassment to the company. I was given the gig and nipped those issues in the bud. So much so, that those who attempted a similar exploit at the next national tournament were thwarted by those who adjusted to a more balanced, reasonable approach to the game, which was PRECISELY the effect I wanted. If I could offer any advice from that debacle, it is to err on conservative design. Simplicity is elegance and there's this urge to make cards that are "WOW". Actually, a much better card is one that doesn't reveal its strength at first glance, but as you play with it, experiment with it and adjust to it, you see its utility. In general Dominion is littered with cards that are only average. Value on the board is not linear, some cards have greater value when other cards are on the board, some cards develop a great engine, but maybe not fast enough if your opponent takes another route with the cards on the board. This is why you can't judge cards completely in a vacuum, and why play-testing is an absolute necessity. My experimentation with all this has only just begun. I will fall down hard as I attempt it, but that's part of the process. This kind of project is iterative. Base set was not perfected at first attempt, it took play testing, adjustments and peer review to bring it home as clean and beautiful as it is. Use your peers here on the forum to review your cards, accept their criticism with grace and adjust accordingly. rink, you've done superb work here, I intend to read the guide again and use it to get better. It's superb fun to develop variants of your own, if only that it highlights just how hard it is to come up with solid, well-balanced cards...which in the end, makes you appreciate this great game even more. This is really really great. This might actually be the best article I've seen on these forums. Probably it is. I may have something to add at some point, but this covers all of the observations about design that I can think of from off the top of my head. Just really great. This guide is so amazing that I registered just so that I could thank you for it! You seem like one of the experts on the Variants subforum, and I'm sure this guide will be extremely useful. Thanks for this hard work! I just realized I forgot something, so I went back and added a couple paragraphs to Part II, namely, "(19) Cards that allow unlimited accumulation of victory tokens." I have no intention of personally making any fan cards, but this was still really interesting to read because it also gives insight as to why existing cards are the way they are. Agreed, this was like reading another secret history of Dominion and shows how thoughtfully and thoroughly Donald approached designing it. Kudos and thanks for the read. I second/third/fourth… what everyone above has said, rinkworks, this is awesome. If this were on BGG, I'd give some serious thumbs. My favorite part was pointing out that Grand Market and Caravan aren't internally consistent with their vanilla +1s. That's the type of thing I normally notice and my friends normally make fun of me for noticing. I'm not going to make fun of you for it, well done. I've never made any fan cards, but now I'm thinking about it. And, if nothing else, I think it will lead to creation of higher quality fan cards from others in the future. Here's hoping! This article may be the best thing written on these forums. Ever. Let's get more discussion going on this thread, if only to highlight its fine work more. I wanted to talk about cards that punish you, in reward for doing something beyond the value of the card. A card that self-inflicts you with a curse for example, was cited as an example of this tactic. Let's play with this idea and see if we can find balanced approaches to it. In other words, despite the fact the article mentions this as a "bad practice", perhaps there are balanced ways to approach it (even the original article suggests there is). You may gain a curse card, if you do, all other players gain a curse. This could be a card for a "cheap witch"...it's a mechanic I had in mind for a card named "plague". It ensures the mechanic doesn't work if the curse cards are out and if there is only one curse card left, the card really falls apart. Assuming the card did something else (like +2 cards), and the card was cheaper than the Witch, you might buy it, if you had the ability to push the curse out of your deck (perhaps it would combo with Masquerade). How about this as a Victory card? Gain a curse card when you purchase this card. This card is worth -1VP for every curse card in your deck. This is more broken I think, but it could work. I figure it would be worth 4$, maybe 3$? It's also a card you could sabotage someone into accepting? You can't buy it when the curses are tapped out though. A good article certainly. IMHO however, can be better if it is shorter. This is an excellent series of articles, and should be stickied. For your point "(5) Powerful cards that incur negative VPs or gain Curses", I agree with your advice about "Gain a Curse. If you do..."
The negative force that balances such a card should be that it makes your deck a little bit worse when you use it. Even if there are trashing cards in the set, the cost should be the opportunity cost of having to buy a trashing card when you otherwise might not have needed it, hope it will draw with the Curses, and spend Actions to trash the Curses. It's not an insignificant problem. One of the favorite cards I have designed is one that lets you return Curses from your hand to the supply for +1 Card, +1 Action, +$2 each. And if you don't, it hands out Curses to everyone else. It also gives you +Buy so that you can buy Curses for yourself. Players wonder aloud why they should ever buy that card, because they can't wrap their brain around the idea that they should buy as many Curses as possible and get rid of them by game end. Until someone does that and cleans their clocks. Really an excellent article! Very well done. However, no discussion of fan card creation would be complete without addressing perhaps the most important question of the whole process: what do you name the darn card?! I have to say I find the thematic connection important, and the lack of attention paid to this element of card creation is a personal pet peeve (an admittedly silly one). Of course, as Donald has pointed out some of the official cards are hard to understand thematically (Workshop builds you a $4 card, and Feast gets you a $5 card how exactly?). But others are just perfect: Black Market, Smugglers (especially as a means to avoid embargoes), Torturer, etc. For me I find that my card ideas start with a theme as often as not. For instance, I've been trying for a while to come up with a Mercenary card that has a variable attack dependent on how much you "pay" the mercenary (probably in discarded or trashed treasures). That works thematically. I've seen too many ideas for cards called Mercenary that seem to ignore this obvious thematic connection. Anyway, I don't know that there is much more to say on this point than this: "don't be lazy! after all your hard work creating a card, give it a name that shows some thought!!" Are any of these cards (below) broken? Look at the top card of your deck, trash it or discard it. When Sample 2 is discarded from play (not during cleanup) gain an Estate. Seems to me both of these sample cards skew the start of the game, an early buy of this card, cleans out your deck nicely, without ruining your turn. Just how powerful is non-terminal trashing? It is so powerful as to be verboten, or if it is costed correctly can it be part of the game? I can't think of a non-terminal trasher, is there one in Dominion play that I am not thinking of? I can't think of a non-terminal trasher, is there one in Dominion play that I am not thinking of? Upgrade and Apprentice are the only two non-terminal trashers that come to mind. I'd say non-terminal trashers are no more verboten than non-terminal Attacks. They exist, but they are rare, and must be carefully considered when being designed. Which isn't to say that other cards shouldn't be carefully considered. Noble Brigand, I'm looking at you. Lookout is the premier non-terminal trasher. Upgrade is fine but expensive and slow, and Apprentice is mostly useful for drawing lots of cards rather than deck trimming. Thanks for pointing out the 3 non-terminal trashing cards. They are either expensive, or have the risk of forcing you to trash a good card, good to know. I love Lookout. @rinkworks: this is an incredible work. thanks as both a designer and a player! the way you've been able to lay out all the issues in a very practical progression is really stunning. At first glance it seems to be Times New Roman bold, but then the 4 looks way off (no serifs) and everything else looks not-quite-right. Sorry, I'm making some cards and I'm sort of a font nerd. Here is a PS3 Template i made years ago. The commercial fonts Dominion uses are Adobe Minion Pro and Adobe Trajan Pro. "+3 cards +1 action would be a crazy power card that could probably never be costed appropriately"
Will Donald X. never stop making us eat our words? Well... the cards that do provide "+3 cards, +1 action" are cards that typically get worse the more you play them. Playing Stables might require you discard good treasures (which can be disastrous in the wrong sort of deck). With Menagerie, you're likely to draw only one card the more you play it. A vanilla card of "+3 cards, +1 action" would still be difficult to price be unbalanced. OTOH, as long as there's a Militia variant at the end of the stretch, Governor can pretty much be played as a vanilla super-lab. Now we've even got a card, Hunting Party, that is strictly better than Lab at the same price. But designing fan cards a tad bit better than an existing card at the same price used to be discouraged all the time. What's the worst that will happen? HP and Lab come out on the same board, and it's as if there are 9 stacks instead of 10. So? We already had that with Woodcutter/Chancellor and the game was still fun. But haters gotta hate. What are you gonna do. All kinds of stuff can work in this game. I try to keep an open mind. Now we've even got a card, Hunting Party, that is strictly better than Lab at the same price. Well, except Hunting Party isn't strictly better than a Lab. For instance, when you already have any one of every card type in your hand, Hunting Party will only draw one card. And there are times that Hunting Party will hunt down a victory card, when you'd much rather have the 2nd card from your deck instead. I think was was meant with this statement is not that +3cards +1 action is a card that is too strong that will never exists. But one where you don't have any reasonable price-point given the current cards. It obviously can't cost 5, I think most people will agree that 6 is also to cheap. So we might think about 7, which is already a difficult price-point in non-Colony game, and then you already are at 8 where you would in most cases prefer the Province. Nerfing the card by buffing the opponent is a method to get it back to the "reasonable" costs 5 or 6, so cards like that where I think never excluded. I think was was meant with this statement is not that +3cards +1 action is a card that is too strong that will never exists. But one where you don't have any reasonable price-point given the current cards. Exactly, yeah. I stand by the statement. I don't think any current official card needs me to eat my words on this one. To clarify, I was truly talking about just a vanilla card with no other effects. Menagerie, Stables, and Governor all have significant drawbacks that make them (1) no longer crazy powerful cards, and (2) costable given the current cards. Suppose your card offers "+3 Cards, +1 Buy." It has to be higher than $4, because the strictly inferior Smithy is priced at $4. But at $5, your new card looks pretty weak next to Torturer, which also offers +3 Cards. Still, it is not STRICTLY weaker than Torturer, so $5 it is. It's strictly worse than Margrave (almost). Well since it's strictly better than smithy and strictly worse (almost) than margrave, seems like it needs a potion cost. Or some buy restriction like Grand Market. Or some cost reduction thing like Peddler. There are so many alternatives. 0P would probably be too expensive. Is this card strictly better than another card? If so, does it cost more than it? If the card references cost, what effect do bridge/highway have on it? Is this card too strong in $5/$2 openings? Would I ever buy this over Silver? Is this too strong to open with? If it's a Victory card, how does this compare to buying a Duchy? $3 - (Hopefully) Never strictly better than silver, doesn't cause problems opening with 2 copies. $4 - Similar in power to $3 cost, but could be too powerful opening with 2 copies. $5 - Power cards, stuff that you should not be able to grab itself and a Silver as an opening. Note: a lot of the cursers are in this price point. $6 - Very powerful, multiple copies may be devastating (Goons, Grand Market), or very good in engines, so much so that they should NEVER be able to be opened with. $7 - Pretty much the same as $6, just a little harder to get earlier. Anything outside this range should be heavily tested to make sure it's good at such a cost. A couple questions about making Fan Cards, as I think I have some good ideas but am still struggling with the formatting of the individual cards. 1) The names of the card + card type are all done in small caps. I use Gimp editing, and I have no idea how to do this. Is there a way? 2) Is there an easy way to upload cards to the forum, or is a third-party site needed? If so, what is a good one? 3) For the information at the bottom, is that needed for copyright? Or if it is old enough (ie. Picasso stuff or older), can that be ignored? 1. I am not sure, but I believe the official font (and the one that is used as a fan substitute) are small caps by default. If not, I would look for some options or palette for the text tool, whatever it is. I know where the option is in Photoshop, but not GIMP. Google could help though? 2. Do you have dropbox? There is a "public" folder that you can use to host images. 3. I think "needed" depends on a lot of variables, but I consider it more ethical to include the line for things that are out of copyright. And for anything not in the public domain, I would ask the artist for permission before using it. Just grabbing images off of Google is not cool. If you use the right font -- either the commercial one that is used on the official cards, or the free font that looks similar (both are given at the end of my guide) -- then you won't have to worry about this. The fonts render lower-case letters as smaller versions of the upper-case letters. I know this is kind of a dead thread, but I can't help it. Rule 12 needs to be gone now. DA, gaining-from-the-trash kind of broke that. I don't think it needs to be removed, just revised. It's been said even before even DA was released, that a trash gainer could be made, but it would have to also put cards in the trash that you'd want to gain. Both examples from DA do just that. Right, duh. Still think it should point out that that effect is on official cards now, though. I tried to piece this together and encountered various problems - the background (template) insisted to be background and didn't want to move over the art, when copied to another layer it lost transparency, jpg pasted into png was losing colours. Did anyone try doing cards this way with success and knows how to overcome the obstacles? - coin, potion and VP shield images in different sizes. You're right; it should. I've tweaked the wording to take the Dark Ages cards into account. Don't want to create an entirely new thread this, but I am wondering if anyone out there can give me some pointers on using Photoshop to mock up some fan cards. I have Photoshop Elements 6.0 and this downloaded, but only seem to be able edit the text. I can't change the default background type or picture. I find it's always a worthwhile exercise to review this guide when new official cards come out, to see which priciples need re-evaluation. Rarely are any of the suggestions flat-out wrong, but often Donald has managed to find a sneaky way to do something. In recent developments, Hireling and Champion (and to a lesser extent Prince) demonstrate how it can be done. And again, amusingly, Champion shows what happens when all your cards are (perhaps unnecessarily) non-terminal. I think it's amazing how well this guide has held up over the years. All #13 says is not to create a new "Permanent" type when "Duration" covers cards that do something every turn. And what do you know, Donald did exactly that. So #13 has been codified rather than discredited. #14 still holds in the general case, independent of stuff like Champion and Lost Arts. It's definitely a testament to rinkworks, and everyone who helped develop it. Not disagreeing with you on either point. Donald certainly left the wording of Durations open enough that the permanent Durations work exactly as expected. And Champion and Lost Arts are both examples of how you can make individual instances that break otherwise fairly solid design principles and have them work. I'd like to add another tip. Part II. - (13-b) Duration effects that does not stack. Let me show you a bad example at first. Now and at the start of your next turn: draw until you have 6 cards in hand. What do you think? Nice? Probably not. All Duration cards are designed to have a role in Combo decks. There are only two Duration cards whose effect does not stack. Outpost and Tactician. Those two have a good reason. Tactician: 15 cards, 3 Actions, 3 Buy if you Throned it? Ridiculous. Be careful when your Duration effects do not stack. It is okay, but you have to explain why it should be unstackable. Tactician stacks. It's tough to make it happen, but you can do it. Golem is one way to do it. Throned Herald is another. In general, I think a non-stacking Duration would be perfectly fine. It would fill a different niche and have to be priced appropriately, but lack of stacking isn't problematic in itself, IMO. All cards should stack unless there's a good reason not to. Mostly this matters for Throne-ing them. Duration cards are not special in this regard. I have a non-stacking Duration in my set right now. Its next-turn effect is: "During your next turn, when you play an Action card, first draw until you have 5 cards in hand". That's because "During your next turn, when you play an Action card, first draw a card" would probably be insane. In order to compensate for the duration part not stacking, it costs $6 and has a generous on-play effect (+$3). Maybe this card won't work out, but it seems silly not to test it just because it's a Duration that "doesn't stack". Theif only affects treasures, a plentiful, non-scoring resource. Unless you have intrigue and Harem is in the kingdom. Granted, like sabotaging a Colony, it is only a four point swing, but for some kingdoms, that could be life or death. Heck, I've won a game with negative vp! so a four point swing can be a big difference. just arguing an edge case. Champion doesn't stack (except with Diadem). Wait, so, for example: I golem my deck. I first encounter tactician (no more cards) and then a village (so now I have one card and 2 actions). That card is a smithy. I draw 3 cards, among which a tactician. I tactician my hand. I draw 10 cards at the beginning of next turn? Edit: so it does. Cool. Another way to do this is to put your +Card token on Tactician, and then Throne it. Could anyone direct me to where the updated .PSD with traveller template can be downloaded from? Thanks a lot! Where is the most updated .psd template? Maybe I missed it in this thread, but is there a source template for us to use for the card back and front design? My son is a graphics design student and I am hoping to interest him in the game by having him design a few 'Fan cards' that I created. The question of templates is addressed in part V of this thread. I would also point you to my automatic image generator, though if you're actively trying to get your son to do the work manually, it may not be what you're looking for. I can direct you to the best GIMP template. Violet's generator is also sweet, but it won't teach you any gimp skills. I should mention (maybe it should get merged with the OP?) that Dominion uses Skat cards. Cards that have a significant difference in power based on the number of players in the game. +$1 for each other player"
This is a horrible idea, but maybe it sounds good to you when you came up with it. But how much *should* it cost? In a four player game, it should clearly cost $6. In a two player game, it should cost $0. Whenever an other player plays a Cursed Idol, you can reveal this from your hand. At the end of your turn, if any player revealed a Cursed Idol when you played this card, gain two Curses." This seems much more balanced, but it still is better when you only have to run the gauntlet of one other player instead of 3 or 5.